Vtg Levis Denim Jacket 80s Size 44 (L) Dark Indigo Blue USA MADE Hawaii Patch! Beautiful 1962-66 LEVI'S (big E) Type 3 TRUCKER Denim/Jean Jacket 557XX sz.40? Vtg 60s Levis 100% Cotton Denim Jean Chore Jacket Workwear Shirt USA Coat M 44"
DENIM JACKET. SLEEVE LENGTH - 24". OVERALL LENGTH - 24.5". PIT TO PIT: 24.5". DENIM JACKET. SLEEVE LENGTH - 24". OVERALL LENGTH - 24". PIT TO PIT: 23". 1984 Olympic Torch windbreaker. Fits like a modern large. Length 26". 27" Sleeve (Shoulder To Bottom Of Cuff). S H I P P I N G.
As pictured. Good for any season - features zip removable thick quilted lining, plus removable faux fur collar. A Connecticut estate find, it is a bit musty but in overall excellent condition. Levi's Hippie Denim Chore Jacket 1970s. Chest: 22". Shoulders: 19". Made in USA. Shoulders (seam to seam): 19". Length (shoulder to hem): 32". Inventory #: c44. Chest (armpit to armpit): 24.5". This is from the 1980s era and the labels are pictured which do confirm this, not a reproduction! The sleeve's snap for closure and there are buckles on both sides to tighten the waistline. This is referred to as a "TRUCKER" style jacket and is not a fitted style but has a BOXY cut. Type III Trucker Jacket. 525 Buttons. Jacket for age is in Very Good to Excellent Condition! Size 40 (I believe that is a small). PERFECTLY BROKEN IN! 4 POCKETS! USED 1980s LEVI'S DENIM TRUCKER JACKET! RED LEVI'S LABEL ON POCKET. TWO CHEST POCKETS, TWO HAND POCKETS. PERFECTLY BROKEN IN, GREAT FADED COLORING. MADE IN USA. Trending at $51.66eBay determines this price through a machine learned model of the product's sale prices within the last 90 days. 24" pit to pit. 26" collar seam to bottom. 24" sleeve. Length (down the center of the back): 23.5". We believe that pictures speak louder than words and do our best to show several photographs of each item, including any flaws we find. When you are finished, you can check out. Shoulder to shoulder - 20". State of HAWAII Patches on left upper sleeve as seen. Length (back collar to bottom hem) - 28”. Chest (pit to pit) - 22”. Hand Picking the highest quality goods is my mission. Size Large. Length 23 1/2". We will send you a revised invoice. Showing a good deal of fading to a current pale blue color. Orange stitching throughout. Again the patch is missing, but the size of its outline is typical of the 557XX, as are the characters stamped on the undersides of all buttons,(either "0" or "O"), the yellow stitching, and of course the big "E" in LEVI'S. THE BUTTONS ARE 555. (E) SLEEVE: 24". (D) LENGHT: 21". (C) WAIST: 17.5". Made in USA. - red "Levi" tab. - embossed logo buttons with "52" stamp on back. Length, center back: 24. Waist: 19. Chest, armpit to armpit: 21. Sleeve length, from shoulder: 24. Featured is a rare genuine Big E Levi’s Jacket. This jacket has been through it all and is naturally distressed from overall wear. This would be a phenomenal piece to anybody’s wardrobe. Pit to pit: 20 in Length: 24 in Please refer to pictures for condition. This very special item contains a mix of details! Red label - BIG E - (on jackets 1971 or earlier). Care label - (on jackets 1971 or later). Great grunge / outdoorsy mood. This coat has seen a lot of life and has many years left in it. 575252 - 1109 100% cotton trucker jacket. Our goal is to send zero waste to landfills, of the thousands of textiles & goods that people throw away every year, as much. as 95% could be re-worn or recycled or re-used. PERFECTLY BROKEN IN! 4 POCKETS! USED LEE RIDERS DENIM TRUCKER JACKET! TWO CHEST POCKETS, TWO HAND POCKETS. COLLAR SEAM TO BOTTOM, ALONG BACK 23". MADE IN USA. A little distressed, see pics. Jacket is like new, appears to have never been washed. Levi's Trucker Style Jacket. Nicely Broken In. Blue Denim. 100 % cotton. Nice pre owned condition with the usual signs of wash and wear. Minor wear and distress. Nice used condition. Flannel lining. Men's large. Pit to pit 25", length 26", sleeve collar to cuff 32". I wore this as a size 8-10 woman. Levi’s 70505 denimtrucker jacket, manufactured late 60’s, early 70’s. No side pockets, two frontpockets only. All buttons are intact. Collar has a white stain and shows wearand frayed small holes. Very good condition. No holes, or fraying on the seams. Collar and cuffs show no damage from usage wear. Spot stain on right sleeve area. Faint brown streaks of staining on upper left sleeve area. See last 2 pics for detailed look. 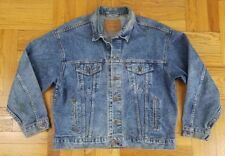 Vintage Levis Denim Jacket Light-medium wash. Blue. Made in USA Men’s size Small. No returns or refunds, so please bid accordingly Please check out my other listings. Thanks! Embroidered unicorn on back and corvette logo in front. Large, oversized fit. Across back seam to seam-23”. Pit to pit-25.5”. Vest is in Excellent shape both inside and out. Jean jacket is soft from many washings. I'm not sure exactly how old it is, I have had it about 20 years and I am not original owner. ORANGE TAB! 1970s-80s LEVI'S DENIM SHERPA FLEECE LINED VEST! ORANGE LEVI'S TAB. LEVI'S QUALITY! SYNTHETIC FLEECE LINING. ARMPIT TO ARMPIT 23". MADE IN USA. Shoulder seam to Shoulder seam: 23". Length of Sleeves: 26". Made in USA, 100% cotton, custom dark blue overdye, #524 button stamp, chest pocket, side-entry hand pockets. Repair on the front right, usually covered when the jacket is buttoned (picture 3). Red tab removed. Levi's 70507 - 4890 Denim Trucker Jacket. Thick Heavy Denim. Length = 27". Jacket Sleeve: From the CENTER of the shoulder area, just BELOW the CENTER of the BACK of the collar, to the END of an extended sleeve. Very normal and common and is in very good condition for jacket of this age.